Stair Lifts, also called stair climbers or stair chairs are for people who have difficulty going up or down stairs. Wheelchair lifts, also called platform lifts or vertical lifts, are for people who use a wheelchair to get around. Wheelchair ramps are a great way for a person who uses a wheelchair or scooter, to get from one level to another. If you are looking for a stair lift or wheelchair lift for a commercial building such as a church, school, or office, contact us. We have years of experience in dealing with the license and permit requirements in these types of applications. We include a one year warranty on labor with all equipment that we install. After the first year we are available to maintain and service your equipment. Options HME Inc. is a family run business that sells, installs, and services stair lifts, wheelchair lifts, and ramps. As our name indicates, we are focused on giving you or your loved one options to make living at home easier. We offer high quality equipment from more than one manufacturer. This ensures that the equipment you end up purchasing meets your specific needs. 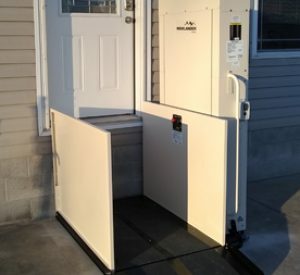 Our Installers and Service Technicians have been trained by our manufacturers and have years of experience installing and maintaining stair lifts, wheelchair lifts, and ramps. Copyright © 2019 Options HME, Inc.